Back from his historic record-breaking mission, the only American ever to have lived in outer space for a year, NASA astronaut Captain Scott Kelly has laid the groundwork for the future of space travel and exploration, and continues to garner media exposure like no other pioneer of our time. From the cover of TIME to live interviews on TODAY to features in Forbes and on CNN, to more than 1 million Twitter followers, the world remains in awe as we celebrate a hero’s return to the planet that is home, from an adventure that is extraordinary. With life lessons and personal stories that reveal unique and valuable advice on pushing one’s own limits, to insight on the leadership and teamwork required in such demanding conditions, and the challenges — such as long term deprivation from loved ones and Planet Earth — Kelly reflects on the choices and life events that paved his journey’s path and brings audiences to the edge of their seats as he delivers a truly one-of-a-kind experience. An astronaut since 1996, Kelly’s achievements over his illustrious 20-year career with NASA earned him the coveted position as America’s first year-round astronaut. On his historic mission that spanned from March 2015 to March 2016, Kelly and Russian cosmonaut Mikhail Kornienko conducted experiments, reconfigured station modules, and captivated the world with live interviews and never-seen-before photos from the International Space Station. 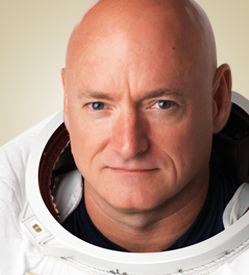 The historic mission also included NASA’s groundbreaking Twins Study, in which Kelly’s identical twin brother, retired NASA astronaut Captain Mark Kelly served on the ground as a control model in an unprecedented experiment to understand how space affects the human body.